MONTRÉAL, QUÉBEC--(Marketwired - Feb. 14, 2017) - Matamec Explorations Inc. ("Matamec" or the "Company") (TSX VENTURE:MAT)(OTCQX:MHREF) and Canada Strategic Metals ("CSM") (TSX VENTURE:CJC)(FRANKFURT:YXEN)(OTCBB:CJCFF) are pleased to announce that CSM has exercised the option to acquire an additional 20% interest ("Additional Option")in the Sakami property as per the agreement between the two companies ("Option Agreement"). To do so, CSM has issued 1,000,000 common shares to Matamec and will now need to complete an independent bankable feasibility study ("feasibility study") within five years. Until the feasibility study is completed, CSM must spend a minimum of CDN$2,000,000 per year on exploration works on the property. CSM will remain the operator of the exploration works during the option period, supervised by a management committee comprising two representatives of CSM and two representatives of Matamec. After exercising the first option, by which CSM spent CDN$2,250,000 in exploration work during a three-year period and issued 2,000,000 common shares to Matamec, CSM and Matamec each hold a 50% undivided interest in the Sakami property (see press release of August 18, 2016 for more details). As per the terms of the option agreement, CSM had 180 days from the initial acquisition of its 50% undivided interest in the Sakami property to advise Matamec of its intention to exercise the additional option. The Sakami Property straddles the contact of the Opinaca and La Grande Subprovinces which offer a variety of lithologic settings in which to host various mineral deposit types (see figure 1). Several mineralized areas hosting significant gold grades are known to exist throughout the Property and have been the focus of exploration work. In August 2016, the property was enlarged by 4,500 ha and now covers an area of 10,737 ha. Mineralized zones are generally associated with the major tectonic contact, which spans more than 20 km on the Sakami property. Before adding 93 new claims in August 2016, exploration work had mainly been completed on the following sectors, from south to north: La Pointe, Péninsule, JR and Île. The recent drilling campaigns, which took place between 2014 and 2016, have been located in the La Pointe sector, particularly on Zone 25, in which gold occurs in proximity the subprovince contact in association with a strong shear zone. PT-16-93 : 1.87 g/t Au over 27 metres. The Péninsule sector is located approximately 1.5 km northwest of La Pointe and is almost entirely within the Laguiche sedimentary units. There are numerous outcrops of greywacke, paragneiss, pegmatite, and a single outcrop of basalt to the northwest. Gold showings in this area are associated with quartz-pyrite veinlets. 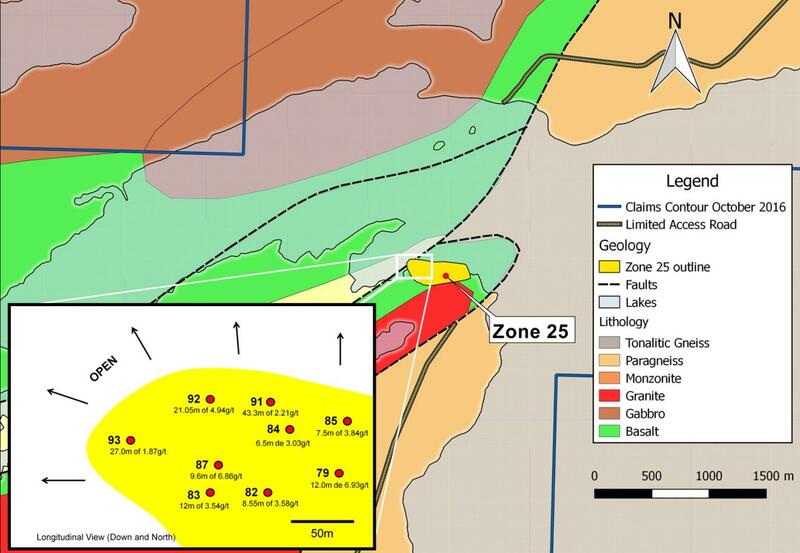 Following channel sampling done in 2016, the Simon showing has been identified and supports the presence of high-grade gold values, with channel sampling results of up to 20.8 g/t Au over 1 metre and 17.45 g/t Au over 1 metre. This new gold showing is located on a geophysical anomaly where a strong magnetic low is observed, as well the junction of multiple faults. It is also located on the contact between the Laguiche sediments (Opinaca) and the La Grande belt volcanic. 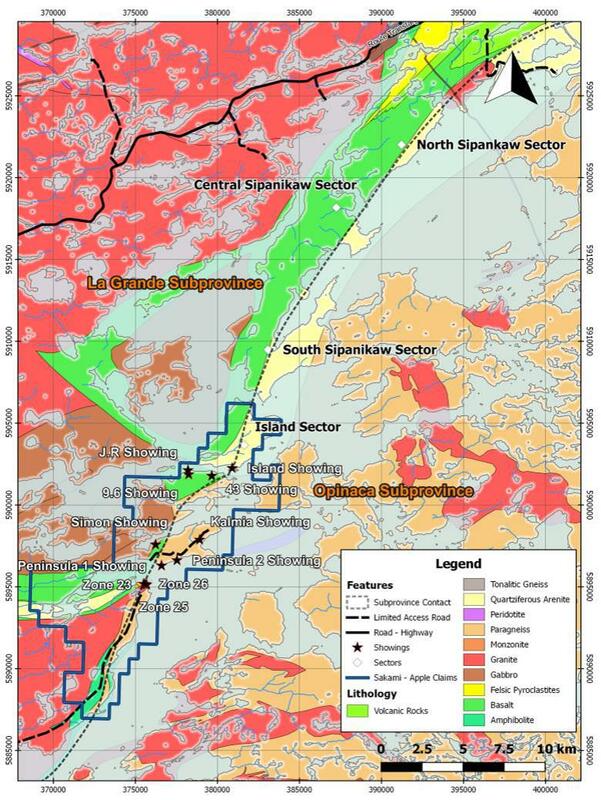 The JR sector consists mainly of Yasinski group basalts from the La Grande Subprovince, which contact the detrital sediments of the Laguiche Group (Opinaca Subprovince) in the east; this contact continues to be the focus of exploration work on JR. The Île showing could be a northeastern extension of the JR showing, 2.5 km to the east-northeast. Matamec has identified three (3) distinct gold zones between the two geological subprovinces of La Grande and Opinaca on the La Pointe sector, namely Zones 23, 25 and 26 from east to west. Zone 25 in particular is continuous along a lateral distance of at least 500 m and extends more than200 m in the down dip direction (50-60 degrees to the south). Zone 25 outcrops at surface, however, it plunges gently to the west-north-west under lake Sakami. The results from PT-16-93 together with PT-16-91 and PT-16-92 confirm that Zone 25 increases in thickness and grade to the northwest. 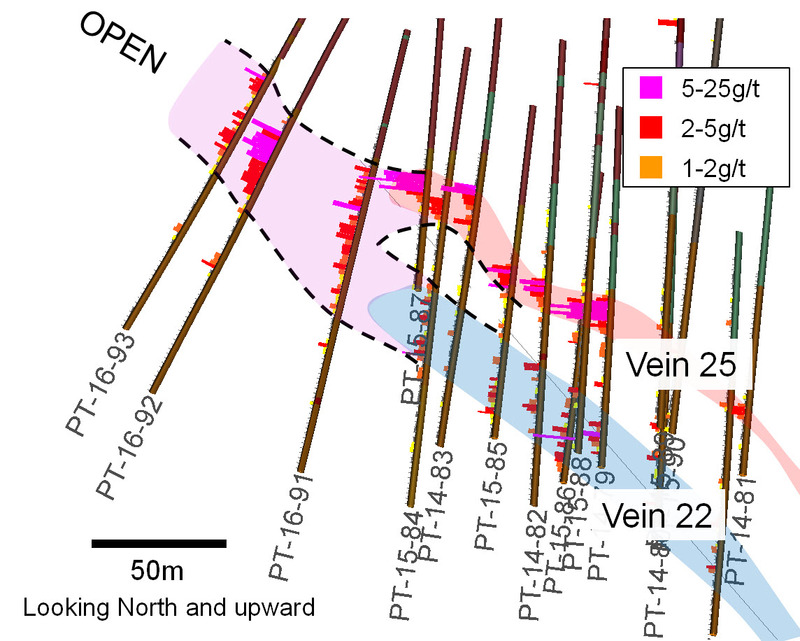 The mineralization remains open to the northwest, as well as at depth, with the best intersects along the northern edge, where the thickness varies between 6 and 40 metres. Note that the grade of the intervals are relatively consistent; there are no extreme grade assays that carry very low grade intervals. The very thick intervals and their relative position suggest a possible merging of Zone 22 and 25 to the northwest (see figure 3). Guy Desharnais, P.Geo., Ph.D. (OGQ No.1141), is a Qualified Person as per NI 43-101; he is employed by SGS Canada Inc., is independent of Matamec, and has reviewed and approved the technical content of this press release. Located in Montreal (Québec), Matamec Explorations Inc. is a junior mining exploration company in which activities are based on two main axes of development: gold, and key elements for technologies related to energy with properties containing, among others, lithium (Tansim-100% owned), Cobalt (Fabre-100% owned), nickel (Vulcain-100% owned) and rare earths (Kipawa-72% owned). In addition to the activities in energy sector, Matamec is exploring for gold, with three properties: HMR (1% NSR), Matheson JV (50% owned) and Pelangio (100% owned), located in the area of the Hoyle Pond Mine in Timmins (Ontario), as well as two in the Quebec Plan Nord region. These include Sakami (50% owned) and Opinaca Gold West (100% owned) properties in similar geological settings as the Éléonore Mine in James Bay (Québec).